Garcinia cambogia is a tree native to India and South-East Asia, the fruit of which resembles a small pumpkin (less than 5cm in diameter). The rind of the fruit is used to make garcinia supplements: it is one of the few significant sources of hydroxycitric acid (HCA), the molecule largely responsible for its weight-loss benefits (1). Garcinia is a popular spice in Asia, particularly for flavouring fish dishes. The rind is traditionally used for relieving rheumatism and digestive problems. Although the fruit itself is edible, it is rarely eaten due to its strong acidity (2). How are Garcinia cambogia supplements produced? Though the rind of the fruit contains between 15% and 30% HAC, this extract of Garcinia cambogia has been standardised to 60%, the maximum available in a supplement. This means that all the substances originally present in the rind have been preserved (for synergistic purposes). Only its hydroxycitric acid has been enhanced to maximise its effects. In order to produce a tablet that can be swallowed, the only other addition to this product is acacia gum, a natural sap exudate collected from the trunk and branches of certain species of acacia forest shrubs. This sap contains 90-97% soluble fibre. Note: A number of manufacturers offer chewable or suckable sweets and pastilles or snack bars containing garcinia but they normally contain much lower levels of HAC than those used in studies. What are the mechanisms of action of Garcinia cambogia? While hydroxycitric acid is the principal active compound involved in weight control, Garcinia cambogia also has various other modes of action. Inhibition of ATP-citrate lyase. HAC may be able to inhibit ATP-citrate lyase, an enzyme required for fatty acid synthesis (3), used in particular to convert excess sugar and starches from the diet into fats. Reducing this enzyme’s activity is thought to produce a decrease in lipogenesis (storage of fat), and as a result, a reduction in weight. Increase in lipid oxidation. ATP-citrate lyase seems to generate acetyl-COA, a molecule which indirectly inhibits the oxidation of fats4. Reducing the activity of ATP-citrate lyase produces a fall in acetyl-COA and thus an increase in fat oxidation, more commonly known as ‘fat-burning’. This effect may be enhanced by combining it with aerobic exercise. Decrease in appetite. In vitro studies suggest that HAC increases the availability of serotonin, which may help reduce appetite and constitute another mechanism through which weight loss is achieved (5). In addition, inhibition of ATP-lyase may lead to a slowing of glycolysis (the process that converts glucose into energy) and a redirection of carbon subunits to the production of glycogen. This process appears to activate hepatic glucoreceptors which may be responsible for an increase in satiety, via an effect on the vagus nerve. What does science say about Garcinia cambogia? The scientific community has been interested in Garcinia cambogia for quite some time. Almost all the animal studies conducted over the last 40 years demonstrate the activity of hydroxycitric acid activity on the de novo synthesis of fats, but human clinical trials and uncertainty over the mechanisms of action of Garcinia cambogia have led some scientists to exercise more caution. Certain authorities have also questioned whether the weight loss induced by supplementation with Garcinia cambogia is maintained over the long-term. Out of 12 clinical trials (double-blind, placebo-controlled), eight, conducted on more than 400 subjects, suggested a positive trend towards weight loss or a reduction in adipose tissue (6-13). The other four trials, involving 200 volunteers, were inconclusive. The methods used in one of these studies were criticised, as participants had been required to adopt a high-fibre diet, which may have reduced gastrointestinal absorption of the HAC, thus negating its action. A recent meta-analysis14 of nine studies showed a significant trend towards weight loss in supplemented subjects compared with placebo (– 0.88 kg). Effect on appetite. . A number of animal studies have demonstrated a reduction in food intake as a result of administration of HAC17. One study of healthy volunteers carried out in 2014 showed an increase in satiety and a decrease in feelings of hunger related to Garcinia cambogia supplementation (18-19). Anti-obesity activity . Several studies have confirmed the suggestion that by inhibiting ATP-citrate lyase, HAC blocks the conversion of citrate into acetyl-COA, the first stage in the synthesis of fatty acids (20). Supplementing with 500mg for three days was shown to reduce lipogenesis in volunteers eating a high-carbohydrate diet (21). While Garcinia cambogia (15), antioxidant (16) and anti-microbial effects. Are any precautions necessary or risks involved in taking Garcinia cambogia? In vitro studies and observations from clinical trials suggest that there are no risks for humans associated with taking Garcinia cambogia at the recommended doses (22-24). It should be noted, however, that Garcinia cambogia should not be taken at the same time as selective serotonin reuptake inhibitors (SSRIs), the psychotropic drugs widely-prescribed for depression, anxiety and obsessive compulsive disorder. In addition, supplementation should not be started during pregnancy or breastfeeding. In the case of cardiovascular problems, hypertension, heart arrhythmia and anaemia, advice should be sought from your therapist. Note: Take care not to confuse extract of Garcinia cambogia rind with resin of Garcinia hanburyi, a powerful laxative with potentially serious side-effects. 214 obese or overweight individuals were monitored for six months (25). Half were given Garcinia cambogia (500mg twice a day), and the other half glucomannan (500mg twice a day). Researchers analysed changes in their weight, fat mass, visceral fat and lipid profile. Some of the subjects were genetically-predisposed to obesity. At the end of the six months, the researchers observed a notable decrease in weight, a significant reduction in visceral fat and an improvement in the lipid profile in both groups, although these effects were less pronounced in those genetically-predisposed to excess weight. No side-effects were reported by either the volunteers or the medical team. No conflict of interest was declared by any of the study’s authors. Why is Garcinia cambogia more expensive than other supplements? Garcinia cambogia supplements have been standardised to contain 60% hydroxycitric acid, as opposed to the 15-30% found in the base product. It’s rare for a manufacturer to offer such a high quality product. In addition, the only excipient used is completely natural: acacia gum, an exudate obtained from acacia sap which is recognised as a natural source of soluble fibre. 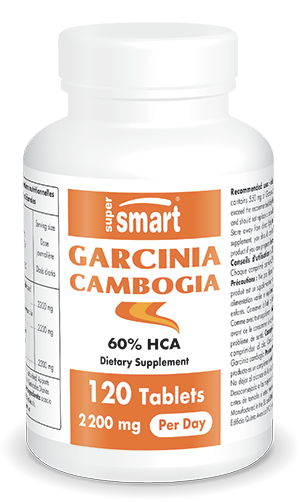 Why is Garcinia cambogia not produced in Europe or the US? The 180 species that make up the garcinia genus only flourish in tropical conditions. These plants are indigenous to tropical Asia and Africa, even though they can now be found in Polynesia. Can Garcinia cambogia be combined with anything else? In order to lose weight, it is advisable to reduce your calorie intake and increase your physical activity (particularly aerobic exercise). Other supplements are available to both help reduce calorie intake, such as CSAT® (with soluble fibre to increase the viscosity of the alimentary bolus and more rapidly induce a feeling of satiety), and Fat & Carb Blocker (with specific polyphenols that partly inhibit digestive enzymes), as well as to help get rid of fat reserves, such as Appetite Control Formula (with green tea to increase energy expenditure). Should I expect to get any side-effects from Garcinia cambogia? At the recommended daily doses, any side-effects observed in studies have been rare, mild and temporary. The amounts used in human trials vary between 1.6g and 4.6g a day (taken in several doses spread across the day). Formulations are available in capsules or tablets for oral use. In the majority of studies, Garcinia cambogia was given 30-60 minutes before a meal as it was shown to produce better results under these conditions26. For a standardised extract such as this providing 60% hydroxycitric acid (HCA), a dose of four tablets a day (ie 2200mg), preferably taken before meals is therefore recommended. Changing your lifestyle and eating habits is the best way of losing weight but this is often difficult to implement and maintain over time. That’s why alternative treatments, particularly nutritional supplements, can provide valuable support. 1. OHIA S.E., OPERE C.A., LEDAY A.M., BAGCHI M., BAGCHI D., STOHS S.J. « Safety and mechanism of appetite suppression by a novel hydroxycitric acid extract (HCA-SX) », Mol. Cell. Biol. 2002 ;238:89-103. 2. LIM T.K. « Edible medicinal and non-aromatic plants » Vol. 2. Netherlands : Springer ; 2012.